Isle of the ocean, say, whence comest thou? And the deep, at thy coming, rolls darkly and loud. Thou art clothed with the darkness, yet crowned with the light. “Where’s that?” – that’s what you’ll hear when you tell people that you’re going to the Azores. The answer is – it’s in the middle of the Atlantic. And it is still, miraculously, a little known destination for North Americans. But this little paradise won’t stay secret for long. As hordes of emerging market tourists flood traditional destinations, experienced travelers are seeking lesser known places. 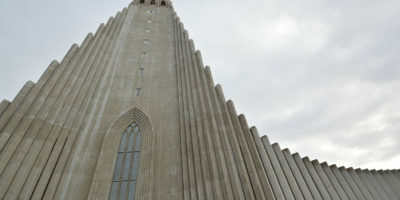 It happened to Iceland, and it will happen to the Azores. And because of its relative affordability and balmy climate, it will happen very quickly. The Azores archipelago was formed by the seismic activity of the “triple junction” of three different tectonic plates, which produced nine volcanic islands and numerous underwater “banks” rich with marine life. Thanks to the Gulf Stream, the climate is mild, described as subtropical or even mediterranean, with only a small variation between the seasons. Therefore, “the season” in the Azores is from April through October, simply because winter is rainy. Mild temperatures and ample rainfall make the islands verdant, lush, and constantly awash with flowers. From dramatic rocky coasts and black sand beaches, serpentine roads trimmed with blooming blue hydrangeas and pink belladonna lilies climb up green velvety slopes to misty volcanic calderas and pine forests. As you look around, you will wonder where you’ve landed – Hawaii? Ireland? Japan? And yet when you arrive in a town, you will find yourself in charming Iberian Europe, with Catholic processions, flowing wine, and afternoon siestas. Finally, under water the Azores hide a whole another world full of mysterious marine giants. Sure, you may say, Hawaii and Europe are great, but you know what nobody likes about Hawaii and Europe? How expensive everything is. Well, lucky for us, the Azores are still a very affordable destination. More expensive than Portugal, but still cheaper than the rest of Europe and much cheaper than Hawaii. If you’ve ever been to Portugal, you know that one of its greatest assets is its people – restrained, dignified, but affable and not without a sense of humor. In the Azores, a more rural and isolated place than continental Portual, surprisingly many more people speak English – in fact, almost everyone. Many have lived in the United States at one time. The largest Azorean immigrant community is in Massachusetts, which explains the existence of a direct route from Logan airport. Currently, there are only two direct flights to the Azores from North America – from Boston and from Toronto. And, unfortunately, these flights are on Azores Airlines, which is a poorly managed, bankrupt airline that continues to operate on government subsidies. You cannot count on refunds or any other fair and mandated EU air transport practices – they simply don’t have the resources to be accommodating. However, direct flights, provided they take off on time, are less than 5 hours long. And Boston is a JetBlue hub, making it a very affordable departure point. I was able to find tickets from Boston to Ponta Delgada for just under 500 dollars. What Azores Airlines lacks in service it makes up for in marketing. The Azores brand seems ready for tourism on a grand scale. The transatlantic jets are printed with a life size photo of a sperm whale. 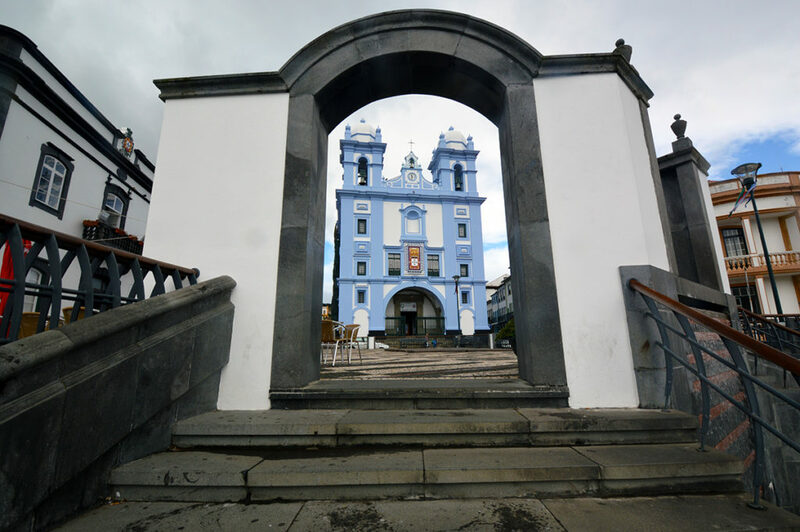 The doors of Ponta Delgada terminal greet you with adorable graphics of volcanoes, sea birds and more whales. But the crowds of tourists have just not gotten here yet. Air BnB options and rental cars do tend to sell out at the height of summer, so you will do well to book them ahead of time. But restaurants, whale tours, taxis, dive sites, hot springs and mountain paths are pleasantly devoid of crowds. Hiking is possible on every island, and information available online to help you plan is second to none that I have ever seen. 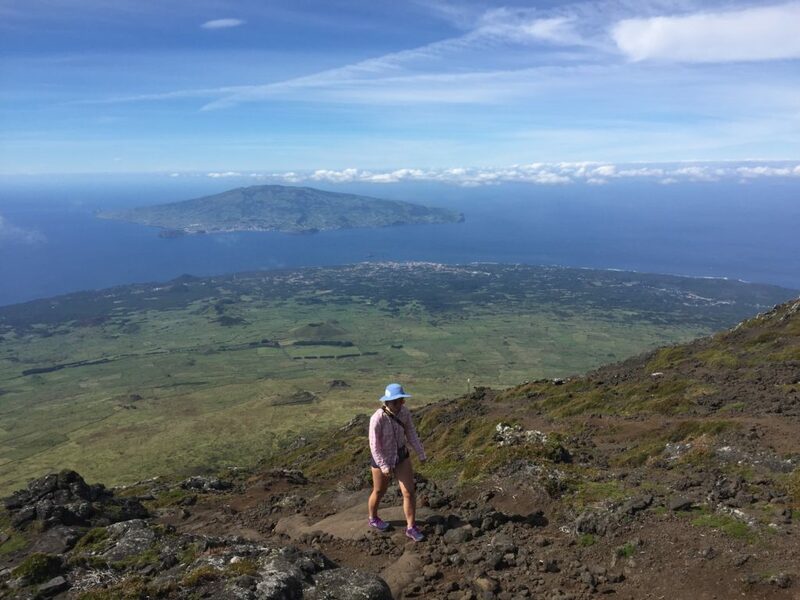 The official tourism website provides a full color guide for every trail on every island, complete with map, elevation, estimated time, points of interest and a printable color handout you can bring along. 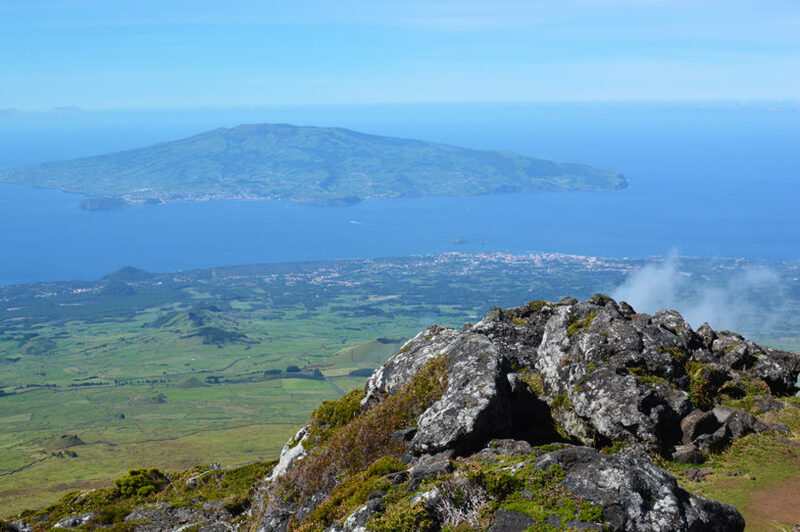 Many visitors take a short flight from São Miguel Island to Pico to ascend the grandiose volcano. The organization of this difficult hike is impressive, with a mandatory personal GPS/emergency cell phone provided for every hiker at the visitor center. Once the trail disappears, you run the risk of walking too far off the route – in that case the park rangers will note your position on their big screen and call your cell phone to get you back on course. Whale watching is one of the popular activities in the Azores. Among many other species of cetaceans that visit the islands, a permanent population of sperm whales resides here year around, feeding on abundant squid. Provided weather has been calm for several days, you are guaranteed numerous whale sightings. Scuba diving is also available on several islands and banks, with many interesting large species to see, such as the famous mobula rays. Much of it is advanced diving in currents. My trip to the Azores consisted of sailing from island to island with a group of friends. 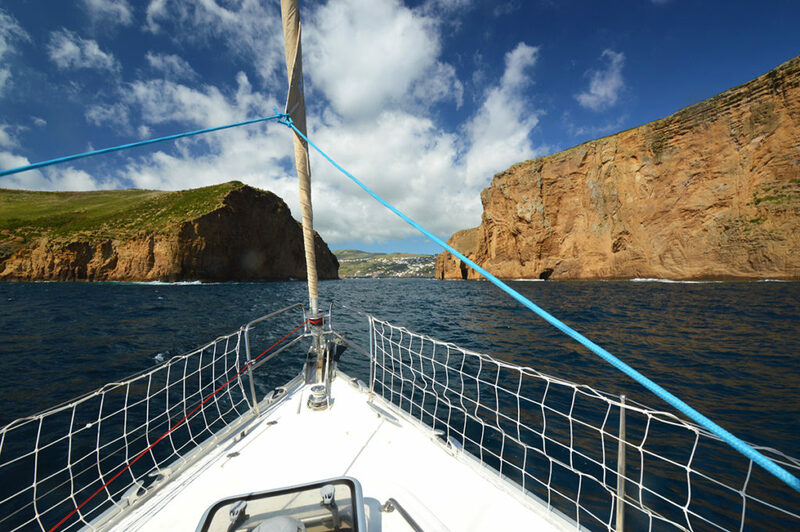 If you know how to sail, Azores is a great place to enjoy this activity – boats can be chartered in Ponta Delgada marina, and several other islands offer comfortable marinas at comparatively low rates. When you are tired and cold after hiking and diving, you can head to one of many hot springs that gurgle up from the hot volcanic heart of São Miguel. You can head to Furnas, a town centered on geothermal spring tourism that might trick you into thinking you are in Karlovy Vary or Baden Baden. Here you will find a large resort – Poça da Dona Beija – with many pools of hot orange water. The spring here is rich in iron oxide and may stain your light colored bathing suits. Or you could opt for sulphur-scented Caldeira Velha, a smaller hot spring park set in a lush, ancient subtropical forest of cycads and tree ferns that will make you feel like you’ve traveled back in time to the Jurassic era. If you’re really adventurous, you can follow the coast from Ponta Delgada for 40 minutes to visit Ponta da Ferraria – a truly unique and exciting hot springs experience. Here the hot water comes out of the volcano into a tiny lagoon, where it is met with cold ocean water rushing in an out. Look up the tide tables and arrive here as close to low tide as possible, climb down the ladder, hang onto a rope and wait for the hot-cold-hot-cold churning to sweep you back and forth! 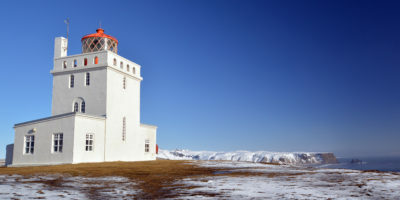 Other islands, reached by short flights, offer interesting and diverse experiences. Go to Flores for spectacular nature and hiking. Visit Terceira for daily running with bulls – that’s right, one village on this island has a bull running festival, complete with food and music, every single day. It’s bizarre and exciting, all the more so because this activity constitutes the center of social life on the island. The mild Azorean climate and a range of elevations provide for diverse farmland capable of producing a wide variety of crops, from pineapples and banans at sea level to plums, apples, and potatoes higher up. Azoreans are very proud of their local food, they promote and serve it ubiquitously – a huge variety of cheeses, seafood, custard-filled pastries, fruits, vegetables, as well as very decent white wine. Mainland Portugal supplies more cheap delicious wine and port. It is a more challenging place for vegetarians, but between the abundance at the grocery store and sufficient tourism, it’s always possible to have a delicious meal.